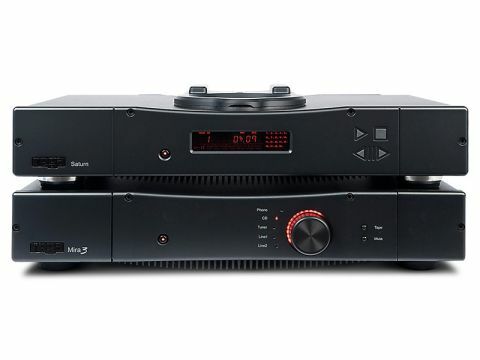 You'll notice that the Rega Saturn CD player is a good deal dearer than the Mira 3 amp and one of its more upmarket touches is an aluminium front panel, whereas the Mira amp has plastic. Despite that, they match very well visually and the control illuminations chime pleasantly together, too. Again, control layout is somewhat out of the ordinary, with the amp apparently lacking a knob; as with the Audio Analogue Crescendo, the volume knob also selects inputs. In this case, you press it to convert to selector mode, then rotate to select. You soon get used to pressing it a second time to go back to volume mode, which it otherwise does automatically after a few seconds. Once again, it's possible to see where costs have been cut, in the amp at least, but it's nothing we'd feel inclined to complain about. The mains transformer isn't the biggest ever, but it's more than good enough for the rated output and the main amplifying circuit is neatly executed with discrete transistors. There's a phono stage built-in and full record output and monitoring. Output connectors are nickel-plated rather than gold, but that's probably more due to Rega's noted disdain for tweakery than cost-saving! The Saturn employs a top-loading transport, which is very quick and pleasant to use and commits to audio purity via a pair of latest-generation Wolfson DAC chips and discrete-transistor output circuits. Our listeners were quick to point to a slight lack of bass from this combination, but it doesn't seem to have interfered very seriously with their enjoyment of the sound. Indeed, one pointed out in the very same sentence that this was one of the most foot-tapping presentations, which certainly serves well in any strongly rhythmic music. At the same time, there is a good degree of clarity in the sound, with detail always present, but not unduly spotlit. Interestingly, two comments on the same track specifically mention the lack of any harshness or 'nasties' – this kind of double-negative is uncommon in our experience and taken together with the general tone of the comments, we feel it may be because there wasn't much to say beyond 'it sounds right'. Intrigued by the bass character, we separated the units and listened to each with familiar references. It seems clear that the amp is responsible for this transgression and indeed the Saturn CD player is, if anything, quite strikingly full-voiced in the lower reaches. The two are well-matched in terms of detail, though it's also worth noting that the phono stage in the Mira restores some of the neutrality that's missing via line inputs. For serious vinyl lovers, we would recommend something a little fancier.